I've been downing gallons of this coca tea in the hope of getting some kind of buzz from it, but all it's done is make me head to the toilet every five minutes. 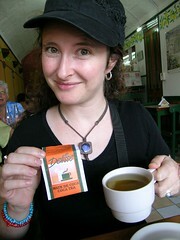 Coca tea is supposed to help you adjust to altitude - OK, so we're only 2k above sea level, but no harm in starting early. 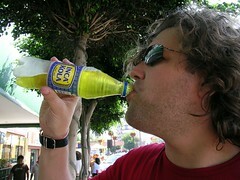 Meanwhile, Phil takes a swig of Inca Cola - drink of Peruvian champions. It's supposed to be a tasty lemon grass-based alternative to Coca Cola, but in fact tastes like yellow creaming soda and should be avoided like the plague.